Most of our client conversations start with “How do I beacon-enable my app?” or, “Do I really need an app?” While the answers to these are pretty simple, what is interesting is the conversation that ensues. Initially, we thought of these as one-off cases, but over time we have realised that a lot of businesses face one common issue — they do not have an app strategy! This might sound a bit surprising, even shocking to some, but it’s true. While many businesses have an app, very few of them actually know ‘why’ they need an app. Is it because their competitors have one, or is it to actually ease out the customer buying journey? This is a critical question every business should ask themselves. The next question is ‘how’ should your app be. The simple mantra for this is: your app should be such that it makes your customers’ interaction with your brand ‘flexible, convenient, and relevant’. Focussing on user experience is the best bet. Begin by addressing issues of frustration that can emerge and then eliminate them. Solving for user actions such as ‘what if they lose their connection?’ etc., will help you build an app that engages customers and not annoys them. Experts suggest that a strong mobile-app strategy is one in which the backend is fully cloud functional. By using a cloud-based backend, instead of spending time writing boilerplate code, your development resources are free to focus on designing the user experience on the front end. 1. Goal of your app: This may sound simple, but a lot of brands are often not clear about what they want to achieve with their app. It’s difficult to achieve all of this at once, so it’s best to have a clear objective in mind and put your efforts in that direction. For example, if you want to generate new business, you would want to send offers to customers who are visiting you for the first time. If you want to encourage repeat business, you would include loyalty based features in your app. Using beacons you can track the number of visits a particular customer has made and how much time he/she spends at your premise – you can accordingly incentivize the customer for spending time with your business. 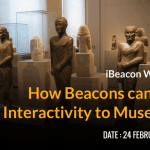 Say, you are a museum and you want to enhance visitor engagement via your app. You would want to push relevant artefact related information to visitors based on their likes and ‘dwell time’ in front of a particular artefact. For each of these type of use cases, you will need to design your app and collect relevant information in your app accordingly. 2. Factor in roadblocks: Two of the most common roadblocks when implementing a beacon app strategy are data connection issues and users having their device’s Bluetooth turned off. a. Data Connection issues: What if you are a retailer, with an underground store? Or maybe you have a museum where mobile data doesn’t work properly. In this case, your app should be built in a way that it does not need continuous internet connectivity for beacon-enabled app features to come into play. iBeacon protocol allows only a small amount of information to be passed to a user’s device. This could be enough for basic use cases such as ordering food or asking for a sales associate’s help. For complex use cases such as in-store navigation, however, you need a robust data connection on a user’s device. Based on what you want to achieve, your app should be coded in a way that even a spotty data connection can help you engage customers. Another solution is to provide Wi-Fi in your store/premise. Users could thus connect to the Wi-Fi and beacon features could come into play. i) Nudge users to turn on bluetooth, using geofencing: If you are using a beacon platform such as Beaconstac , you could use the new feature called ‘Places’ that allows businesses to define a geofence with ease. All you have to do is choose ‘Places’ from the console navigation, click on ‘Add a new place’ and type in the attributes such as name, address (latitude and longitude values). Once this is done, they you can easily define the range of a geofence (in metres). For more in-depth information on how to program these custom messages, read this post about geofencing on our developer blog. ii) Use advanced features in your app to turn on user devices’ bluetooth: If you have integrated Beaconstac’s SDK into your Android app, for instance and that app has been run atleast once on a user’s device — you can turn on the bluetooth on their phone (this obviously requires prior permission from the user). In case of iOS devices, however, this is not possible. Once you have taken these into account and designed your app, consider the following two steps before rolling out your app to customers. 1. Integrate with your Marketing Strategy: After launching your beacon-enabled app, the next crucial step is to integrate it into your overall marketing plan. Your beacon campaign should be a natural extension of existing strategies and tactics. Make use of the customer reach you have rather than reinvent the wheel! You can modify your email and social media campaigns to drive app downloads and encourage people in close proximity of the beacons to give it a try. You will need to plan your promotional campaigns in advance to increase ROI. 2. Ensure app Security: When it comes to beacons, privacy has long been a major concern among consumers. This, however, is a misconception. Beacons are only capable of identifying a particular mobile device’s proximity to beacons and any notification is triggered only by the app and not beacons. Beacons, by themselves, cannot track or collect data about customers. Also, with Apple having locked off the ability for users to manually input Beacon UUID numbers into an app, apps can no longer scan for beacons that aren’t their own. You, therefore, need to program your app by actually specifying the UUID of the beacon that it is connected to. 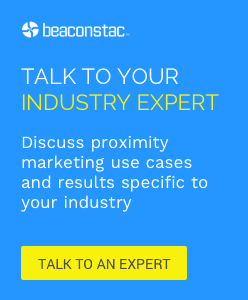 What other factors do you consider when devising a beacon app strategy? Let us know in the comments below.